Ken Goldberg: news, articles, presentations. News, Articles, Presentations, Videos on: Research, Art, AI and Multiplicity, and Other Topics. Learning Ambidextrous Robot Grasping Policies. Science Robotics Journal. 17 Jan 2019. Shake Hands with the Future. New York Times video feature by Mae Ryan, Cade Metz, and Rumsey Taylor. 31 July 2018. How Robots are Grasping the Art of Gripping. Nature Journal. Richard Hodson. Vol 557, Issue 7704. 10 May 2018. Dex-Net 4.0 Robust Robot Grasping. Will Knight. MIT Tech Review, 26 March 2018. In the Future, Warehouse Robots Will Learn on Their Own. Cade Metz (NYTimes, 11 Sep, 2017). The Most Nimble-Fingered Robot Yet (w/video on Dex-Net 2.0). Will Knight (MIT Tech Review, May 2017). Why It's So Hard For Robots To Get A Grip. Sean Captain (Fast Company, Jan 2017). The Future of Robots in Automation. der Spiegel (in German), Feb 2015. 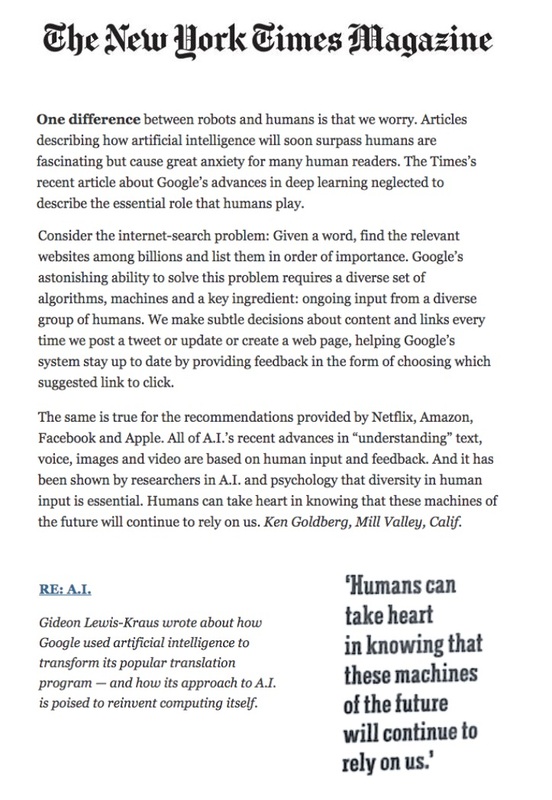 Robots and the Return to Collaborative Intelligence (Commentary). Nature Machine Intelligence Journal. volume 1, pages 2–4. January 2019. Robots with Their Heads in the Clouds. Medium, Aug 2014. The Robot in the Cloud: A Conversation With Quentin Hardy, NY Times, Oct, 2014. Cloud Robotics. Megan Garber. The Atlantic. Jun 28, 2014. Cloud Robotics and the African Robotics Network (AFRON) '$10 Robot' Design Challenge Winners: World Maker Faire 2012 (15 mins, YouTube). Update on Robot-Assisted Surgery. Eliza Strickland (IEEE Spectrum, May 2016). Robot-Assisted Surgery - UCSF Surgery Grand Rounds. Oct 2015. New Research Center Aims to Develop Second Generation of Surgical Robots. John Markoff, NY Times, Oct, 2014. RAPID: Robot-Assisted Precision Irrigation Delivery Project. People and Robots Working Together to Save Water and Enhance Agriculture. Dec 2016. Let's Amplify California's Collective Intelligence. Lt. Governor Gavin Newsom and Ken Goldberg. Op-Ed. San Francisco Chronicle. 11 June 2014. Next Generation Brainstorming. Oct 2014 (highlights: 4 mins). The Atlantic: Rashomon Project by Adrienne LaFrance. Apr 25, 2014. Opinion Space: Using Dimensionality Reduction to Visualize Public Opinion and Crowdsource Insights, Nov 2010. Presentation on Next Generation Brainstorming and Hybrid Wisdom Labs at Web 2.0. SF, Oct 2011 (10 mins, YouTube). Remote Control. Kara Platoni (East Bay Express, Nov 2005, hair-raising). Wrestling with the Real: The Art of Ken Goldberg. Sci-Art in America, Interview by Joe Ferguson, Feb 2016. The Index and the Interface. Article on Legal Tender art installation, by Kris Paulsen. Representations Journal, Vol. 122, No. 1 (Spring 2013), pp. 83-109. A Century of Art and Technology in the Bay Area (WAFR. Dec 2016). Bloom, Seismic Artwork. Article in Boom Magazine with JoAnne Northrup (Summer 2015). Robots and Creativity. Naultilus Magazine Interview with Jeanne Carstensen. Jan 2015. J-Weekly: The Golem and Robots. Aug 2013. The Atlantic: Bloom Art Installation. by Geoff Manaugh and Nicola Twilley, March 25, 2013. Ken Goldberg and the Art, Technology, and Culture Colloquium. Lara Wolfe. Berkeley Center for New Media. Sept 2014. Presentation on the Uncanny, Robots, and Surveillance. (15 mins, YouTube) March 2014. My 5 Favorite Movie Robots. (Financial Times, March 2013). Multiplicity: Are AI and Robots a Threat...or an Opportunity? Oct 2017 (with link to June Wall St Journal Op-Ed). AI may not be bad news for workers. The Economist. 13 Sept, 2018. How AI Can Amplify Human Competencies. interviewed by Frieda Klotz. MIT Sloan Management Review. Fall 2018. Cognitive Diversity: AI and the Future of Work. Tata Study. September 2018. Countering Singularity Sensationalism: Review of Three New AI Books. (Nature Journal, 2015). Multiplicity vs Singularity. (Video) ReInvent SF. July 2017. TEDxOakland: "Are AI and Robots a Threat...or an Opportunity?" (20 mins, 22 Oct 2017). TEDxBerkeley: "Can Robots Inspire Us To Be Better Humans?" (17 mins, May 2012). Springer-Nature Panel on Life and Robotics. Heidelberg, Germany. Oct 2017. Let's Ditch the Singularity and Focus on Multiplicity (Medium 2015). Don't Worry: AI Needs Humans. Ken Goldberg (NY Times Magazine Letters Jan 2017). Will Machines Make Better Decisions Than Humans? (World Economic Forum, Jan 2015, 5 mins). Robots For Real. IEEE Spectrum and NPR Radio. 2009. "'Made in the USA' can be Revitalized". Ken Goldberg and Vijay Kumar. Op-Ed. San Jose Mercury News. 24 October, 2007. Conversation with William Gibson at JCC SF. Podcast. Oct 2012. Photo: San Francisco Thought Leaders. Print Magazine, Spring 2017. "Rise of the Robots" The Next Billion Seconds - Podcast with Mark Pesce, (42 mins, 2 Dec 2017). Wonderland Episode 1: Could You Fall in Love with a Robot? With Steven Johnson. (Podcast. Aug 2016). Future of Robotics interview on UC Science Today. Jan 2013 (Audio, 20 mins). Conversations with History Interview with Harry Kreisler, April 2011. (video). Conversations with History Interview with Harry Kreisler, August 2005. (video). Inside the Artificial Intelligence Revolution. Jeff Goodell (Rolling Stone Magazine, March 2016). AI on Brain Hunter. Pere Estupinya (TVE: TeleVision Espanola, Spanish National TV, Sep 2017 - note: 11:44-17:00). Multiplicity is More Valuable Than Singularity. Interview with Audrow Nash (2015). The Future of Robots and Jobs. BBC Forum Radio. March 2015. Interview with Harry Kreisler, April 2011 (video). Did Einstein predict the secret of the Cherubim? Amichai Lau-Lavie and Ken Goldberg (Feb 2016). The First Pair of Tongs: A Paradox for Rabbis and Robots. Adam Naftalin-Kelman and Ken Goldberg (J-Weekly, April 2017).